Soak corn 3-4 hours and then strain. Boil them and then keep them aside. 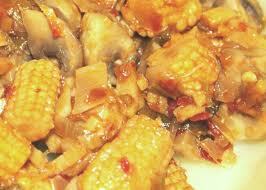 Cut mushroom into four pieces. Finely chop onions and cut ginger into thin long slices. Cut green chilies into 2 lengthwise. Cut tomato into small pieces and capsicum into cubes. Heat ghee in a pan and fry onion until it turns pink. Then add tomatoes and red chilly powder. When it is cooked properly then add mushroom and corn seeds. Add salt and simmer until mushrooms soften. Now add capsicum and lemon juice and fry for a minute and then remove it from the flame.